Forbidden Tresspass is definitely not Milan. I don't think Child of Slaughter is either, but I'm not sure on that. Just searched Child of Slaughter on google and the only info was available on amazon-Japan! Has got the feel of a Travis/Helfer's novel. And if you read the blurb REALLY feels like the current CRAPPY one. Boo. Which brings me too an idea to save DL. Milan and GRRRRRRRRRRRR Martin are best buds so we get him to be seen reading or big up the Dl novel cue epic sales receipts, hey presto DL Ol and Mack Bolan is back. Child of Slaughter was written by a new writer. I can't reveal his name as I don't know whether he's writing under a pseudonym or is using his given name. I remember learning of the series by finding one book for sale in a certain bookshop by a very old job of mine sometime in the early to mid 1990's (Damned if I could recall which one it was). I loved what I read. I hit a few used book shops after that to check out a few more titles and was completely hooked. I do hope that the last DL novel will have some sort of closure to it, though after reading all of the posts in this thread an option like that may be doubtful. I've been following this series since the beginning. Guess I'll have to hook up with another action series. With good guns, of course. To hear that Victor Milan is doing the LAST DL for GE which could mean the last DL ever.. Make me really sad. His work is okay, but nothing like AP's or Chuck's. LE SIGH. well, I'm working on a Diesel Punk style WWI alt history, post apocalyptic series.... as soon as I find a good home for it, and a writing partner who wants to work with me, that is. Shame we can't figure out a way to get one author to write an ending to the series! I'd gladly pay towards it! Haven't been to the forums here for so long, but have still been reading every issue of DL as it comes out. Have also been trying to fill in any gaps I have had in the series from day one. GE closing shop, no closure to the series? Awwww, frack ! I'm with, thedupleman. A proper ending to the series needs to happen. What can I do to help that along? Of course I would rather see it continue, even if with another publisher. I started this series many many years ago. And have enjoyed the trail, I have every single Deathlands book and would like as others to see a decent ending to the series if that happens. Or if another publisher picks it up then it may continue. But my real thought would be for a good ending and move on to some new series and characters. No matter which way it goes I will still be around. Having gone back and read all of this thread, checked out Mr. Ellis' link to GE folding it's wings and hurriedly going to Amazon to pre-order the last books, I have to say ... I will still miss the series, both DL and OL and even the odd Mack Bolan I picked up over the years. I'm not a writer in any sense of the word, ok 1 published poem, but I am a prolific reader. Just for the reading. I never even had an inkling of the Dark Days that rocked the publishing world a while back. Until OL became Ellis-less, I enjoyed this "grandson" of DL almost as much as Ryan and co.
For me though, Deathlands bacame as comfortable to slip into as my favorite pair of sneakers. Only once did I actually have to put down an issue because I did not recognize the characters at all. I'm sure you all know which ultimate stinker I am talking about. Despite this comfort I derived from this series, I do agree on one point. Like your favorite 'ol Yeller, you've loved him and cared for him, but he needs to be put down. I would wish to see him go on but that would be cruel. At the very least, though, pun intended, He needs to go out with a BANG ! 'ol DL shouldn't go out with a whimper. Thank you Ron for building and manning this ship for so long. I will be stopping in now and then if just to see the direction you settle on. An ever Apologetic Canadian reader, ha. The next three look good but the synopsis of the last two leave me feeling.......flat. Hello fellow Deathlanders, been a while since i've been on. Lot going on. And thanks for updating my password Ron. 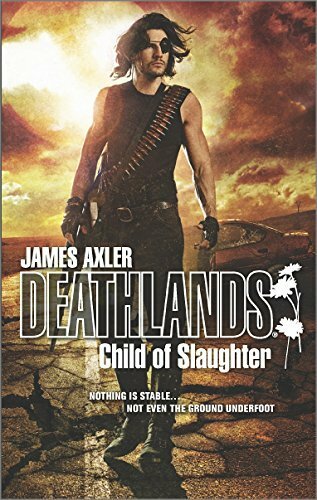 I would just like to say how much this saddens me to hear that the Deathlands will be no more, been reading them since I was 19 and am now 43, no-matter what was going on in my life.And it will feel like something is missing without them...But to all the authors I would like to say...thank you for giving what you had to the continuing Deathlands Saga and with that I am looking forward to the upcoming novels post-haste. With that being said, Good Show I say! I SAY GOOD SHOW! Well, I read my first book in '92...followed the series for a good 16 years after that. I did get kind of slack in the last few years but it looks like I will have to find all the missing titles knowing that there is an end in sight.